George Graham Reviews Kate Rusby's "The Girl Who Couldn't Fly"
The enduring popularity of traditional-styled Celtic music has paved the way for the emergence of a younger generation of artists who are building on the sound and taking it to new places. The band Solas and its various members are probably the best-known example. That scene has also helped to revive the popularity of English folk in the US, as well, with long-time groups like Fairport Convention releasing a steady stream of new recordings. One of the bright new lights on a scene that blends English folk with Celtic influence is Kate Rusby. She has just released her sixth solo CD in the US, an album called The Girl Who Couldn't Fly. The daughter of a pair of folksingers, Ms. Rusby was born and raised in Yorkshire, where her family had a ceilidh band, in which she was playing fiddle by five. Her Yorkshire accent is still apparent in her singing. She studied music at Barnsley College, but she was not sure she wanted to make music her career. She started a collaboration with a childhood friend, Kathryn Roberts, and the two formed a band called Equation. There was a Rusby-Roberts duo album, which gained a fair amount of critical praise in England. Ms. Rusby was also part of the all-female folk band The Poozies. In 1998, Ms. Rusby released her first solo album, Hourglass which became a surprising hit in England, the biggest-selling folk album of the year. And since then, she has been issuing one critically praised CD after another. The new one, The Girl Who Couldn't Fly, follows the pattern of her last few, with a mix of traditional songs, traditional lyrics she set to her own music, and original songs she wrote that sound as if they were hundreds of years old. This CD has a bit of a surprise with the inclusion of an old doo-wop song which is made to sound as if it passed down from the days of knights and castles. Once again, she is joined by her producer, musical collaborator and husband, John McCusker, who is also a member of the long-running Scottish group, the Battlefield Band. The instrumentation is similar to Ms. Rusby's past recordings, with no drums to speak of, and almost entirely acoustic instrumentation. The orchestrations can be rather eclectic with a string quartet and a brass choir present in various combinations. There are also instruments like harmonium -- a kind of reed organ you would find in a small rural church. Ms. Rusby and Ian Carr, another of her long-time collaborators are heard on guitar. There are some contemporary compositions on the CD, but lyrically, the songs definitely fit right in with the old traditional folk tales, evoking bygone days of chivalry. As enjoyable as the songs are, the CD does revolve around the singular voice of Ms. Rusby, with its quiet delivery and hint of a quaver. She has become another of the great women singers to come out of the English folk scene, following in the footsteps ofr the late Sandy Denny of Fairport Convention to Maddy Prior of Steeleye Span, as well as June Tabor, Linda Thompson and Jaqui MsShee. Kate Rusby's new CD The Girl Who Couldn't Fly is another delightful album by England's 20-something folk sensation. With her instantly memorable voice, she again is able to conjure music that sounds as if it came from misty castles, even though much of it consists of original compositions. John McCusker's tasteful and subtly eclectic production, with unconventional instruments creating pleasing, but distinctive textures, is a significant part of the CD's appeal, as is the nice collection of songs which runs seemlessly from traditional to original. Our grade for sound quality is an "A." The sound is intimate and warm, Ms. Rusby's subtle voice is especially well-recorded, and the dynamic range, the span between loud and soft is quite respectable in this era excessive volume compression on CDs. 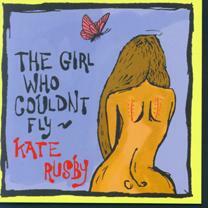 Although The Girl Who Couldn't Fly is an outstanding CD, Ms. Rusby's previous releases are of similarly high quality. So I could not single this out and say that it's definitely her best recording. But for fans of Ms. Rusby's music, it's a CD that shouldn't be missed, and for those developing a taste for Celtic and British Isles folk, this is a great way to get to know this bright young artist.